The nation’s capital is filled with so many activities. It can seem daunting and downright impossible to fit them all into one trip. But, don’t let this discourage you from exploring DC! A well-planned visit to Washington DC will leave your family with a rich sense of history, a greater appreciation for our country, and memories to last a lifetime. Experience DC’s museums, memorials, and government icons with our top 10 things to do in Washington DC with kids. Georgetown, the most historic of Washington DC’s many neighborhoods, is a favorite of both locals and tourists. Most visitors visit for its boutique and high-end shops, but of course, also for its famous cupcakes and charming cobblestone streets. Stop by Georgetown Cupcake or Baked and Wired for some of the best treats in the city. While you’re in the neighborhood, go down to the Potomac River. The views of the Kennedy Center and Theodore Roosevelt Island from Georgetown Waterfront Park are some of the best in DC. In the summer, the fountain in the park is perfect for splashing around and cooling off. In the winter months, there is an outdoor ice skating rink in the nearby Washington Harbor. There are plenty of historic homes, a beautiful garden, the terminus of the historic C&O Canal, and a world-class university to check-out as you walk through the neighborhood. 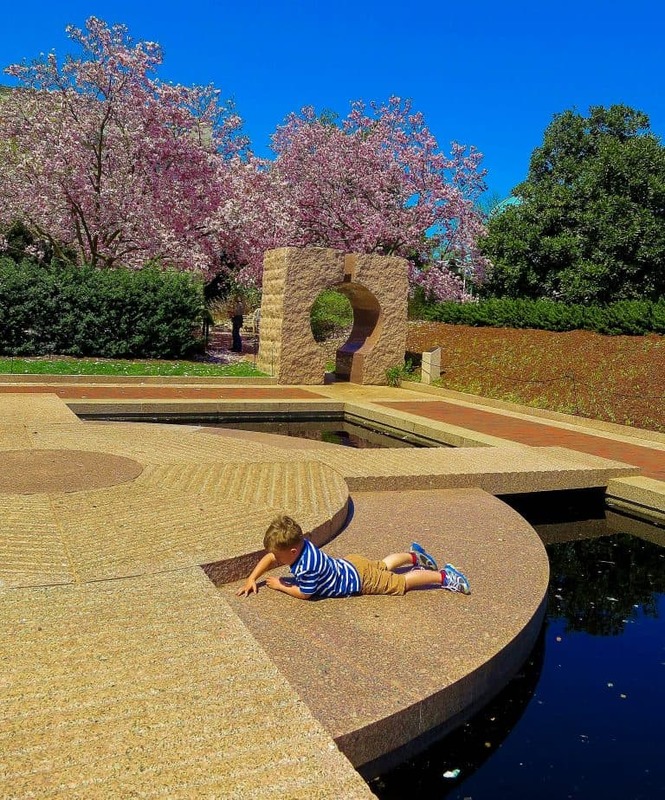 For a list of kid-friendly must-do’s in the neighborhood, check out Trekaroo’s guide to Kid-Friendly Georgetown. If you would take the time to walk through St Mark’s Basilica in Venice or Westminster Cathedral in London when you visit Europe, then you should consider a visit to the Washington National Cathedral or Basilica of the National Shrine of the Immaculate Conception when you’re looking for things to do in Washington DC with kids. The Basilica of the National Shrine of the Immaculate Conception, while relatively modern, is one of the most spectacular Catholic churches in the Americas. It has impressive architecture and a world-renowned collection of sacred art. The basilica is on the campus of the Catholic University of America only a short walk from the Brookland/CUA Metro stop. The Washington National Cathedral is equally exquisite, though a bit more challenging to reach via public transportation. 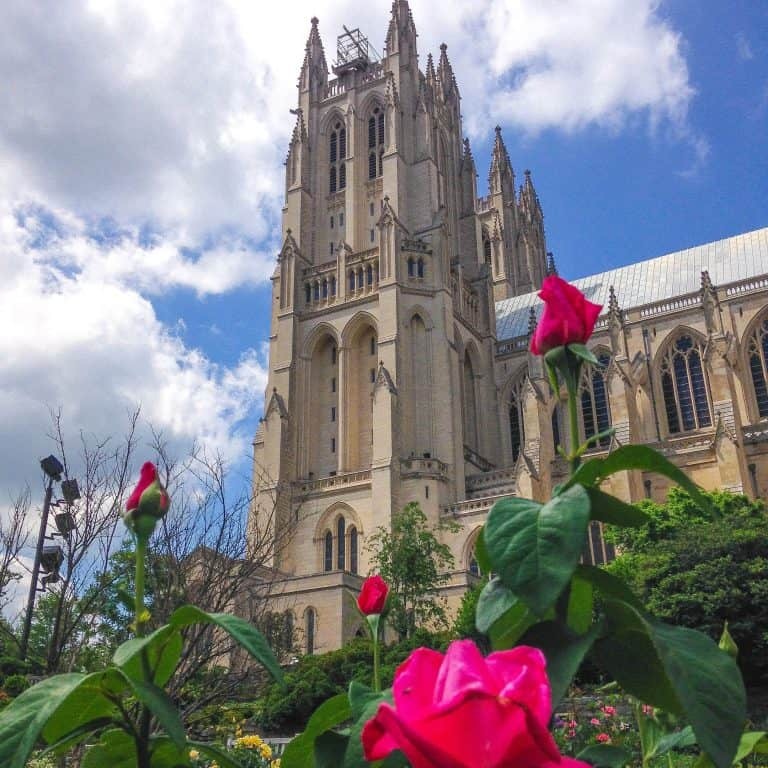 Many intriguing kid-friendly highlights can be discovered in the Washington National Cathedral. These highlights include a moonstone seamlessly incorporated into a pane of stained glass and various animal creatures carved into the ornate woodwork of the choir chairs. The view from the top of the cathedral is also one of the city’s best. 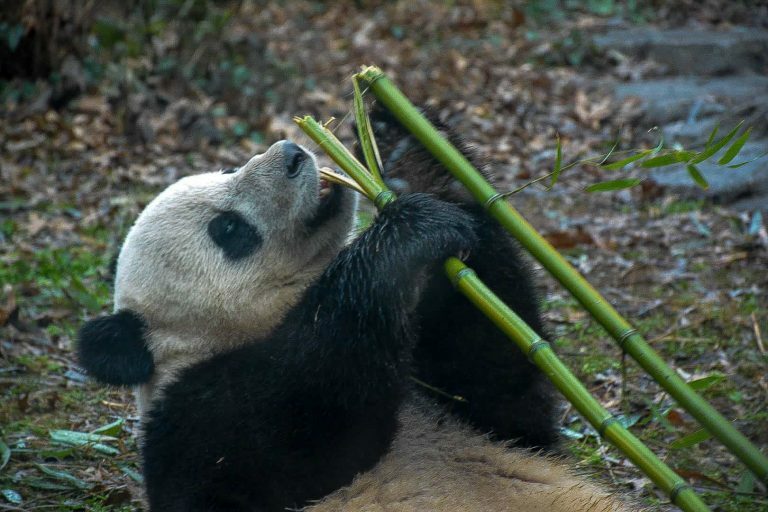 The 163 acres of the Smithsonian National Zoo are brimming with over 2,000 animals and 400 species that call it home. Of course, there are lions, tigers, and bears, but there are also sea lions, gorillas, elephants, pandas, and so much more. 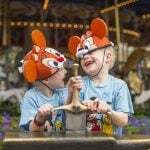 Children are sure to enjoy the Kids’ Farm and Carousel. There are a few places to grab a bite for lunch so you can stay practically all day. The free admission is icing on the cake! 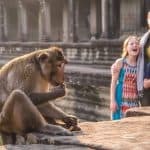 If you visit Washington DC with younger children, it’s likely that your itinerary will be a bit different than if you only have teens that can walk around the city from sunup to sundown. Read my recommendations for a few places off the beaten path for Exploring Washington D.C. with Toddlers and Young Children. 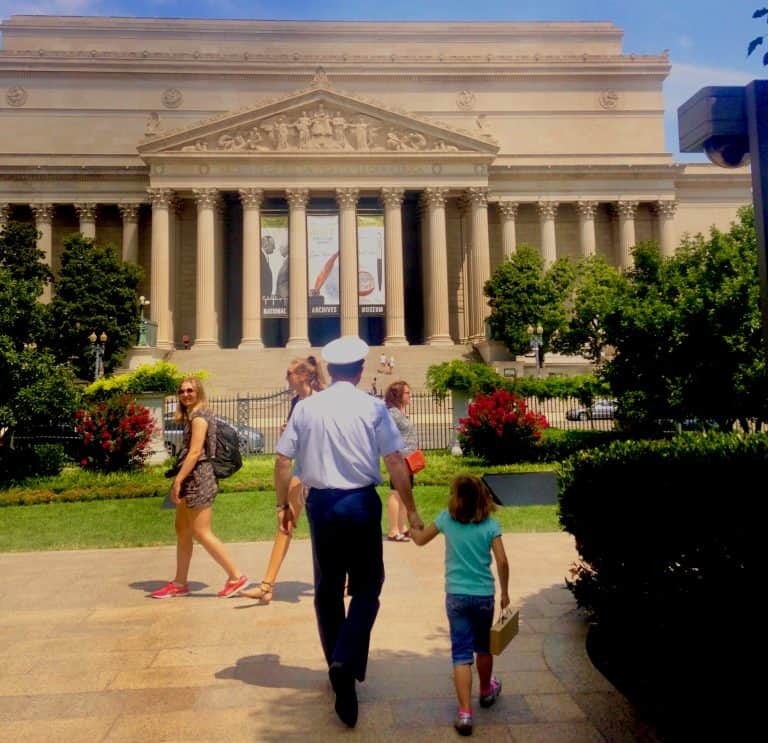 The National Archives should be on the top of your family’s list of things to do Washington DC with kids. The Magna Carta, Declaration of Independence, the Bill of Rights, and the Constitution reside in the Rotunda. They can be seen up close so visitors can feel the power of their influence on the way we live today. Documentary films rotate in the theater throughout the day, sharing the history of the Charters of Freedom. The Public Vaults interactive exhibit is a journey through history with such treasures as George Washington’s handwritten letters, Lincoln’s wartime telegrams, recordings from the Oval Office, draft cards, and immigration records. Learn about US paper currency at the Bureau of Engraving and Printing through a film and gallery tour. Visitors walk the gallery overlooking the production floor. Below they can see millions of dollars being printed. The Bureau of Engraving and Printing is conveniently located between the museums on the National Mall and the Tidal Basin. It is right next to the US Holocaust Memorial Museum. Both the Bureau of Engraving and Printing and the Holocaust Memorial Museum require free tickets during the spring and summer months. The tickets are available first come first serve in the morning at the Bureau of Engraving and Printing and online for the US Holocaust Memorial Museum. Newseum, is a seven-story Washington DC museum that tells the story of media and freedom of the press in the United States. 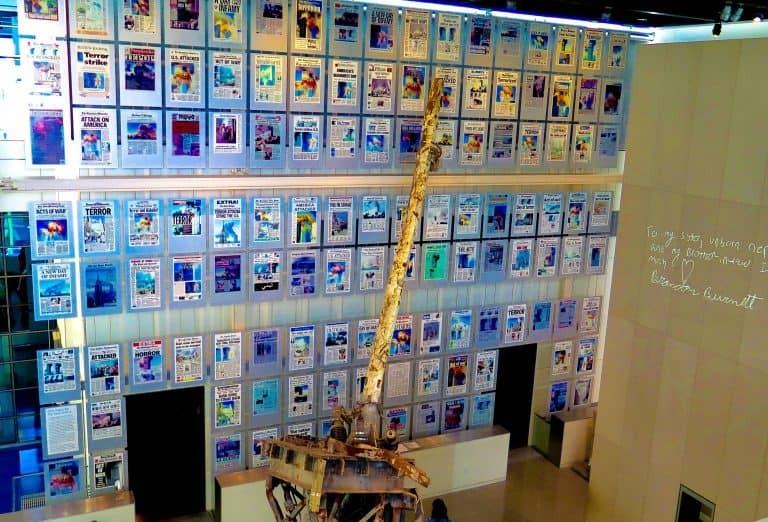 While there are a few interactive exhibits that youngsters will enjoy, this museum is the perfect place to get your tweens and teens thinking about the role the media has played historically and continues to play in United States politics. As a former high school teacher, I love how this museum challenges older kids to think critically about the news that they see and hear in order to assess its bias and legitimacy. Even from the outside, the US Holocaust Memorial Museum speaks to the events during and surrounding the Holocaust. Graphic photos and personal artifacts often elicit tears. While it is a sad part of our history, the museum encourages people to honor the victims of the Holocaust. It also calls us to halt and prevent genocide from happening today. While viewing the exhibits of this museum is a truly invaluable experience for teens, the museum takes at least a few hours to visit. It is a very emotional experience so parents should carefully decide if they have enough time and energy to give this museum when considering which things to do in Washington DC. Read about teaching your kids about the Holocaust before you visit any Holocaust site. Standing at the US Capitol Building and looking down the National Mall at the museums lining each side can be overwhelming. It’s hard to know where to begin – or continue after you’ve already hit the highlights of the Washington DC’ s history museums. But, the good news for families is that the National Art Gallery, Smithsonian National Air and Space Museum, Smithsonian National Museum of Natural History, Hirshhorn Museum, Smithsonian Institution Freer Gallery of Art and Arthur M. Sackler Gallery, and National Museum of African Art are all completely free for visitors. That means that you can walk into the museum, through the ever-present DC security, view the most notable exhibit, and walk out of the museum ten minutes later. Or, you can spend all day if you’d like. The Hope Diamond, the African Elephant located prominently in the first-floor rotunda, and the Hall of Mammals are the must-see sights at the Smithsonian National Museum of Natural History. However, there is so much more to see if you have the time. Younger children often love seeing the bugs and insects up on the second floor. For children eleven and up, the hands-on Q?rius education area on the ground floor is open to the public when school groups are not visiting. For young scientists, this is one of the best things to do in Washington DC for kids. The National Gallery of Art is one of the most overlooked things to do in DC with kids on the National Mall. If you are visiting the National Gallery of Art with younger children and do not know where to begin, be sure to pick up a family guide featuring just one area of the museum’s humongous collection. 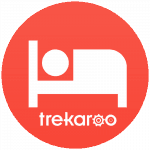 Trekaroo families with tweens and teens also recommend the audio guide for families visiting with older children. Regardless of the age of your children, you’re unlikely to see the entire museum unless you are true art connoisseurs. That’s fine; enjoy what you can and return on your next visit to Washington DC. Yes, there are even more free art museums on the National Mall and a few outdoor sculptures gardens too. To find these museums, walk towards the historic Smithsonian Castle. Nearby you’ll find the Hirshhorn Museum, home to modern art and special exhibits. The Freer and Sackler Galleries, which house several floors of Asian art including the magnificent Peacock Room, are next door. The nearby Enid A. Haupt Garden is especially lovely in the spring when the magnolias are in bloom. A visit to these gardens is one of the best things to do in DC during the spring bloom. There are a few Smithsonian Museums that are technically not on The Mall but are still worth a visit for families with interest and time to spare. I would encourage every family visiting Washington DC museums to at least stroll through the National Portrait Gallery. The National Portrait Gallery also happens to share a building with the Smithsonian American Art Museum, which often offers activities for families and children. While not one of the top things to do in DC, the National Postal Museum is one of the most interesting places in the District for transportation loving little ones. Kids love climbing in and out of the trucks and railroad cars used to deliver mail. Even on the busiest summer days, this fun Washington DC museum is notorious for being crowd-free. Aside from Newseum, most of the Washington DC museums are free. But, there are some freebies only the locals seem to know about. 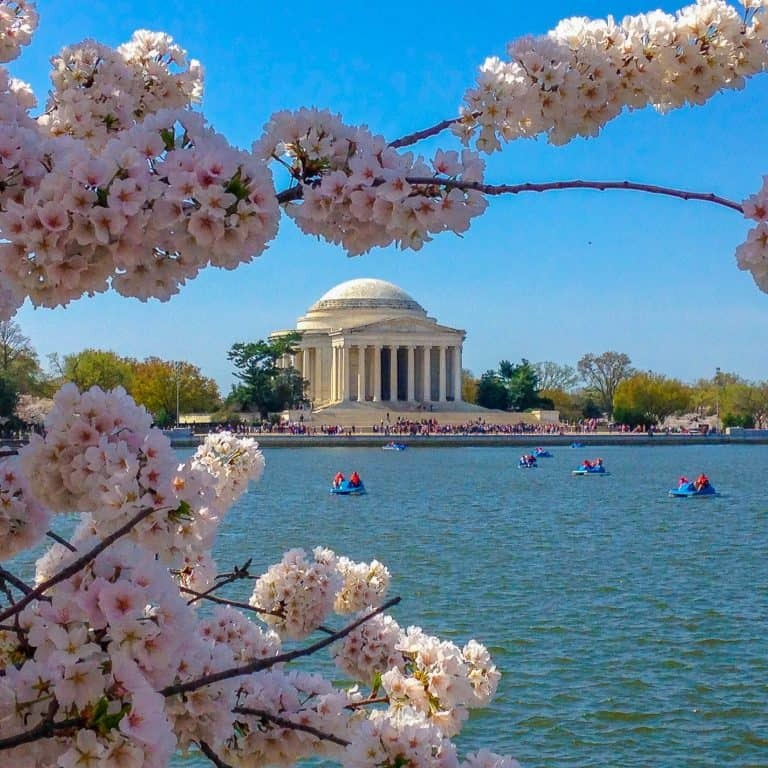 Here’s a helpful Trekaroo guide for budget travelers: Things you didn’t know are free in DC. The United States Capitol Building is an impressive presence on the National Mall. It is an iconic Washington DC building that every family should make the effort to tour on their visit to the city. It is important to arrange tours of the US Capitol in advance because they are very popular with both foreign and domestic tourists. However, the tickets are not nearly as difficult to come by as those for the White House. 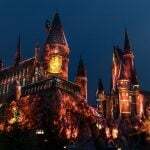 Ideally, families should contact their representative to arrange a tour as they are sometimes able to organize smaller tour groups with extra perks. Also, many representatives are eager to provide extra information about traveling to Washington DC to their constituents. If you are not able to contact a representative and arrange a visit, there are tickets available online. Prior to your tour, families must pass through one of the tightest tourist security checkpoints in Washington DC. After entering the building, families have an opportunity to walk through the US Capitol Visitor Center. It has several interesting museum exhibits about the history of the building. There is also a large lobby area with statues representing many of the states in the union. The regular tour has one guide for a large group of tourists that follow along using a pair of headphones. The tour visits the rotunda and a few other rooms, but not the House and Senate chambers. After touring the US Capitol, families should take a few minutes to walk through the underground tunnel that connects the US Capitol Visitor Center to the Library of Congress. The Library of Congress is easily one of the most beautiful buildings in the nation’s capital. It easy to visit in less than half an hour. While you’re in the neighborhood, be sure also walk past the Supreme Court and possibly even pop inside for a few minutes to check out the judicial chamber. The Supreme Court is one of the most overlooked things to do in Washington DC. Check for deals on family-friendly hotels in Washington DC. The most coveted ticket in all of Washington DC might just be the ticket for a White House tour or one of their annual events like the White House Easter Egg Roll. For United States citizens, these tickets must be requested well in advance from your congressional representative. (For all other nationalities, tickets must be requested through an embassy.) This is definitely a tour that you want to take seriously. Visitors often dress up a bit. It seems that the security regulations are always in flux. So check carefully just before your visit for details. However, once you enter the White House, you’ll immediately know that all the lines and security were totally worth it. Visitors see several rooms including the East Room and the State Dining Room. The relatively new White House Visitor Center is also worth a short visit, especially if your family was not able to arrange tickets to see the White House itself. From favorite Presidential meals across the ages to a touch screen version of the White House Tour, this is the best place in Washington DC to get an overview of Presidential history. Of course, there is plenty of Presidential History throughout the nation’s capital, from the house where Woodrow Wilson lived after his years as president to The Willard Hotel which has hosted Presidents from time to time. Most notably and unforgettably, Ford’s Theatre National Historic Site where actor John Wilkes Booth shot President Lincoln should be on your family’s list of things to do in DC. This Washington DC museum begins with a chronicle of Lincoln’s life from his parents’ biographies to his White House term. Glimpse documents written in his own hand and personal photographs that give insight into his life and loves. From there, the museum provides a detailed account of his assassination, with additional artifacts on display. See the suit Lincoln wore the day he was killed, and the Deringer pistol used to shoot him. The National Park Service offers opportunities for earning a junior ranger badge at the White House, President’s Park and Ford’s Theater. Look for more junior ranger programs? There’s plenty in this area! See Trekaroo’s guide of Where to Become a Junior Ranger Near Washington DC. 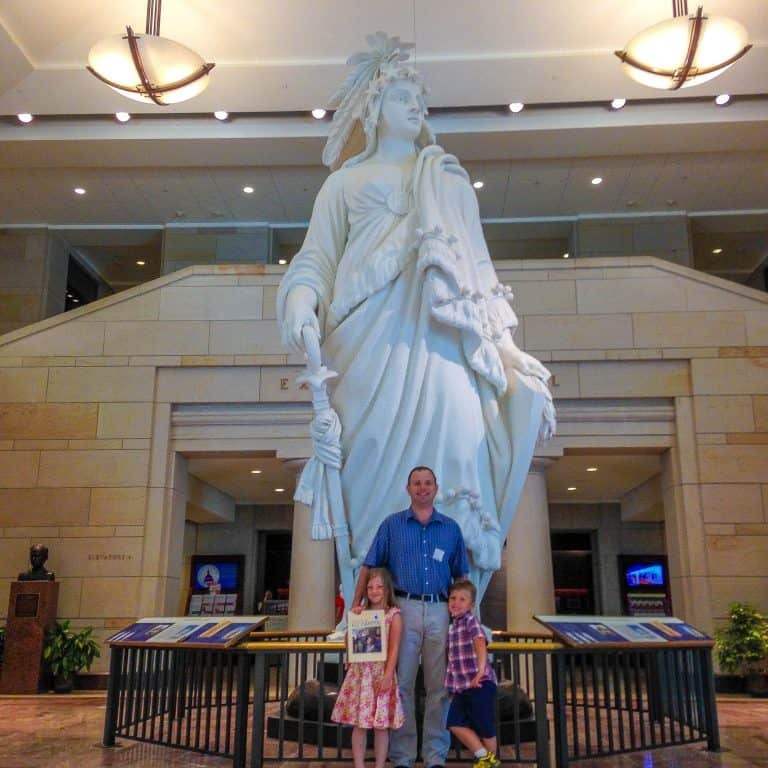 For most parents, the reason why they choose to visit Washington DC with their kids is that they want their children to experience the American history lessons that this capital city has to offer. While the US Capitol and White House have a huge impact on every visitor, Washington DC’s museums also play a large role in illustrating the nation’s history to visitors. It isn’t necessary to carefully consider each and every exhibit — especially with children. It’s often best to just hit the highlights because there are so many things to do in DC, and visitors generally have so little time. The Smithsonian Museum of American History is unique to Washington DC. Thus, it is an important stop on any Washington DC itinerary. Most notably this Washington DC museum is home to the Star Spangled Banner, the American flag that inspired our national anthem. The American Stories exhibit on the second floor is a fun walk-through featuring a rotating mix from the museum’s collection often including at least a few pieces of media memorabilia that will be familiar to children, like C3PO from Star Wars or Dorothy’s ruby slippers from the Wizard of Oz. Finally, the gowns of the First Ladies on the third floor is always a favorite for my daughter and I. The Smithsonian National Museum of African American History and Culture is the newest museum on the National Mall. It opened in 2016. This Washington DC museum requires at least a few hours to visit fully. 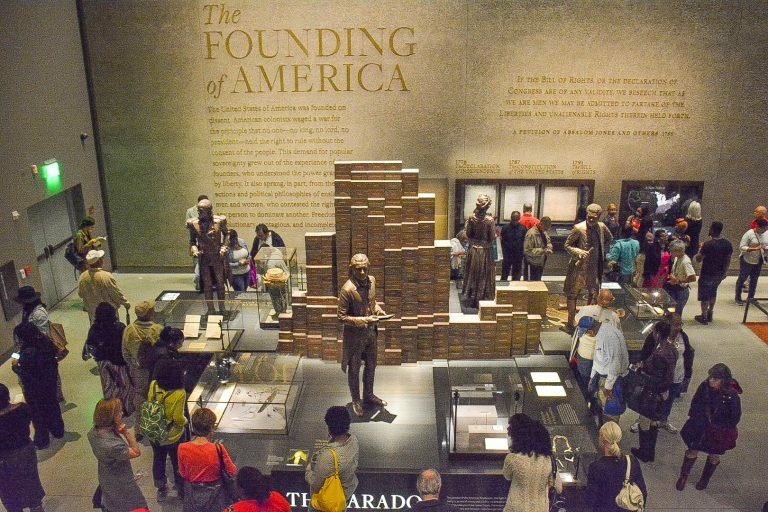 Visitors walk through the main exhibit hall from bottom to top, beginning in the depths of an African slave ship and walking up towards the modern day through the Civil Rights Movement. It is an emotional experience that is most educational for tweens and teens. However, it is not totally inappropriate for younger children. Timed entry tickets are being phased out in 2019. They are likely still required during busier times of year through 2019 and possibly even 2020. Finally, the National Museum of the American Indian has an American history story to tell as well. This is a great place to learn more about Native American history and culture. If you’re stopping by its tasty cafeteria for a meal and have an extra half hour or so, take the elevator all the way up to the museum’s top floor. The media production there serves as an introduction to the exhibits in the museum and is the highlight of the collection. For a complete list of Smithsonian Museums and parent reviews, check out Trekaroo’s guide to the Smithsonian Museums. My family has now lived in the Washington DC Metro area for almost five years. We’ve visited the monuments and memorials in Washington DC dozens of times. I’ve visited them by foot in the spring, on a bike in the fall, on a warm summer evening when they’re lit up brightly with lights, and in January when they’re covered in snow. It never gets old. The view of the Tidal Basin filled with white puffy cherry blossoms in the spring is probably my favorite. However, I do also enjoy listening to the Army Band playing beneath the Washington Monument at sunset in the summer. It can take three or four hours to walk past all of the memorials and monuments, especially if you take the time to complete junior ranger activity sheets available at most memorials. My favorite path through the memorials is to begin at the Jefferson Memorial and walk along the Tidal Basin through the Franklin Delano Roosevelt Memorial. A quick walk along the Tidal Basin then brings families to the Martin Luther King Jr. Memorial. At that point, leave the Tidal Basin and walk towards the Lincoln Memorial, visiting the nearby Korean War Veteran’s Memorial and Vietnam Veteran’s Memorial on the way. After climbing the steps to the Lincoln Memorial and admiring the view, walk along the reflecting pool back towards the Washington Monument and World War II Memorial. For more information on completing the National Mall junior ranger program, read Trekaroo’s guide to the Washington DC Memorials Junior Ranger Program. Walking the National Mall from museum to museum can work up quite an appetite! Families will be relieved to know that most Washington DC museums have a restaurant or cafeteria available for hungry visitors. Some of these cafeterias, however, are far superior to others. A longtime local favorite on the south side of the Mall between the US Capitol building and the National Air and Space Museum is the Mitsitam Native Foods Cafe inside the National Museum of the American Indian. This cafeteria is a bit pricier than average, but the quality of the food is excellent. There are several different stations featuring native foods from around the Americas. The Navajo fry bread served with honey and powdered sugar is a favorite for my kids. This cafeteria does get busy at lunchtime. Unfortunately, it also does not have many choices for pickier eaters who like bland foods. On the other side of The Mall, there are far more options. My favorite is the new Sweet Home Cafe at the Museum of African American History and Culture. It is modeled after the Mitsitam Cafe. It is also a cafeteria-style restaurant that serves traditional regional food. You’ll find many good barbecue options here. It does have more kid-friendly options than the Mitsitam Cafe. The only drawback to the Sweet Home Cafe is that you must have a ticket to enter the museum. If you are visiting the Smithsonian National Museum of Natural History, the Smithsonian National Museum of American History or the National Art Gallery but don’t have a ticket to the Museum of African American History and Culture, I recommend the Pavilion Cafe in the National Gallery of Art Sculpture Garden for quick service food. This cafe is especially good in the winter time when it serves hot drinks. The cafeteria at the Smithsonian National Museum of Natural History and the food court in the nearby Ronald Reagan Building and International Trade Center are busy but convenient options as well. Beyond the museums and The National Mall, there are two convenient neighborhoods where tourist families can find a good meal, the Capitol Hill neighborhood and the Penn Quarter area. Of course, being that Washington DC is quite a cosmopolitan city, there are other neighborhoods that feature more traditional ethnic cuisines across the District. However, these neighborhoods, like Adams Morgan, are a bit of a trek on the Metro from the major tourist sites for families that have spent an entire day sightseeing. Ted’s Bulletin has multiple locations in the DC Metro area. The most easily accessible one for tourists is in Capitol Hill just a few blocks past the Eastern Market Metro Station on 8th Street SE. Ted’s Bulletin serves up American comfort food, which is sure to be kid-friendly. Ted’s signature pop tarts are always a hit with the kids — trust me, the seasonal ones are always the best! The Smithsonian Museum of American Art and National Portrait Gallery are located in Penn Quarter. 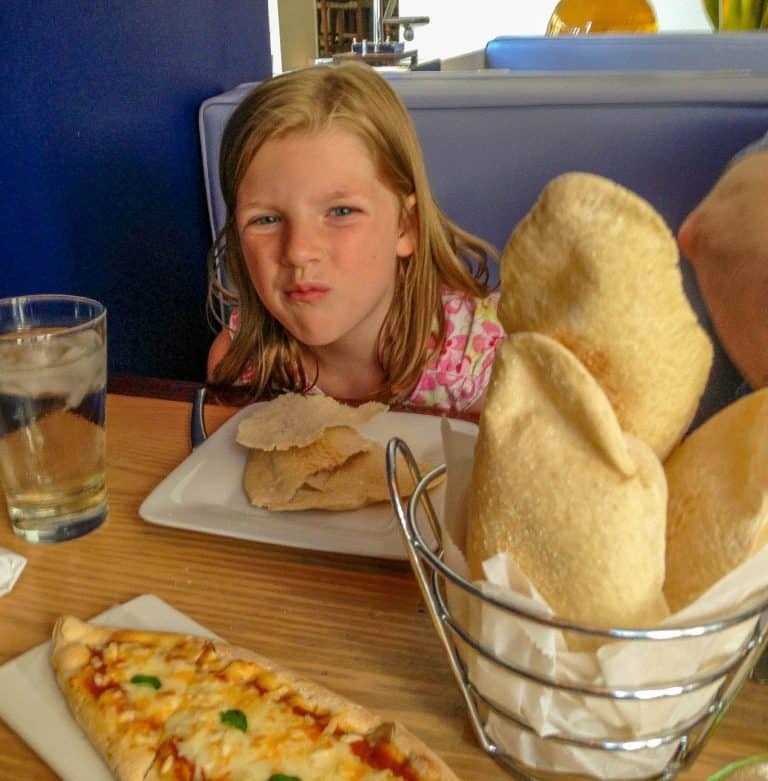 District Pi Pizzeria and Zaytinya are two popular restaurants for families in this neighborhood. Middle Eastern, especially Lebanese, cuisine is always a good bet in the DC Metro area. Zaytinya is one of the best places to go for food with a Mediterranean influence. There is no kids menu, and you’ll likely have to make a reservation for dinner. However, the waiter staff has always been a great help in finding something that my picky eaters will eat. If you’re not feeling so adventurous, yet still want to sit down and enjoy your food, District Pi Pizzeria is a good choice. The pizza is so good, that you’ll smell the pizza before you even see the restaurant. For a quicker meal in this area, the Shake Shack and District Taco are local favorites. There are many hotels options for families visiting Washington DC. However, the majority of the hotels do cater primarily to business travelers. Thus, the availability and prices of hotels in downtown Washington DC are highly seasonal. Generally, it’s easiest to snag a good deal at a well-located hotel in Washington DC from Thanksgiving until mid-March. In the summer months, many locals leave the District in August to escape the oppressive heat and humidity. 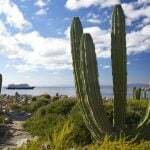 Consequently, there are fewer business travelers in town in late summer as well. Early September and early June bring fewer school groups to the city and less crowds at the major tourist sites. 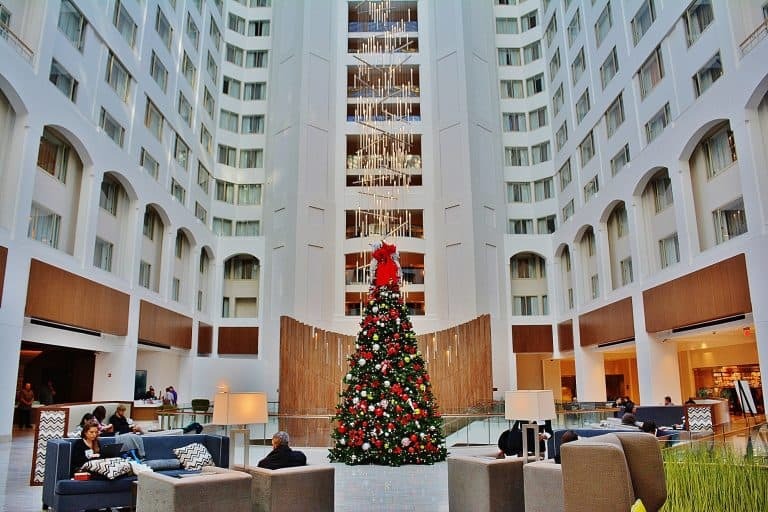 For families traveling from a distance and visiting Washington DC for the first time, it is best to choose a hotel near Metro Center if your budget allows. The Grand Hyatt Washington is a favorite location of Trekaroo families because both the White House and Smithsonian Museums are within a 10-minute walk of the hotel lobby. The lobby at the Grand Hyatt is also connected to Metro Center. Families can easily catch the Metro to Arlington, Capitol Hill and the National Zoo from Metro Center. Two other options in this neighborhood are the Hilton Garden Inn Downtown DC and The Willard. 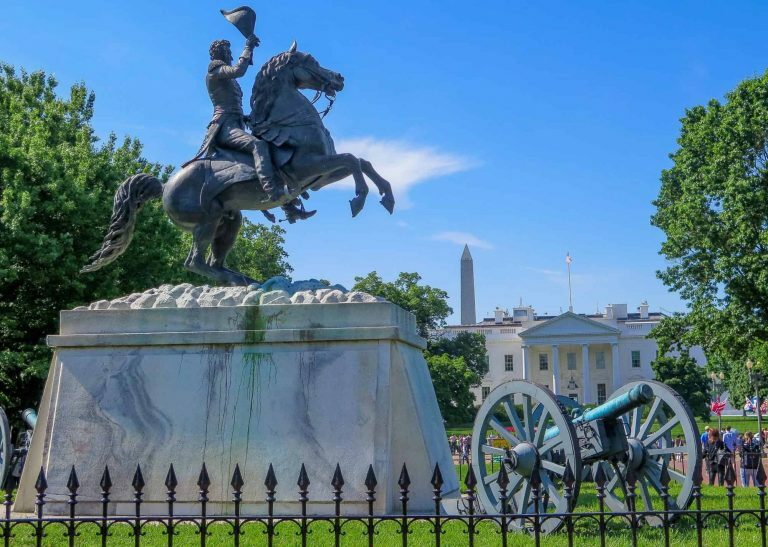 Families interested in experiencing the feel of Washington DC’s more residential neighborhoods should consider the Kimpton Hotels in Washington DC. Many of these hotels are located to the northwest of the White House where lots of international embassies can be found. Like the vast majority of DC hotels, the Kimpton Hotels have a business feel. However, they also have various family-friendly amenities not found at the other brands like bunk beds and kid-sized bikes. Few of the hotels in Washington DC offer economical overnight parking options. Thus, most visitors will find having a car in Washington DC to be a hassle. Cars are only necessary for day trips outside the city. If you are arriving in Washington DC as part of a road trip, it is likely best to look for accommodations in Northern Virginia. For a more comprehensive look at Trekaroo’s favorite family-friendly hotel properties in Washington DC read our article on Top Washington DC Hotels for Families. Spend an afternoon at Arlington National Cemetery exploring different eras in US history. Watch the Changing of the Guard at the Tomb of the Unknown Soldier. Visit the eternal flame at the JFK gravesite. The Pentagon Group Memorial from 9/11 is heart-wrenching but rewarding, as is the memorial to the Challenger explosion. Be sure to pick up a map at the visitor center, and bring your own hydration. 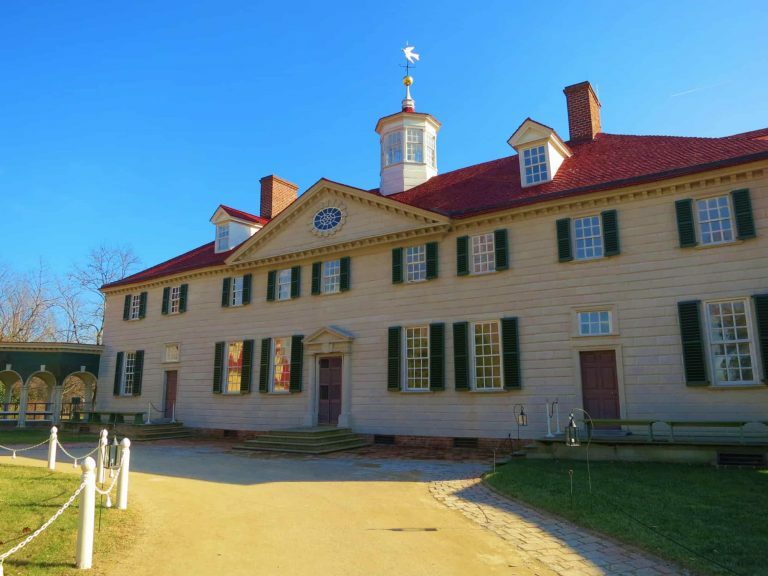 At George Washington’s Mount Vernon Estate and Gardens take in a movie about the Revolutionary War at the Ford Orientation Center. 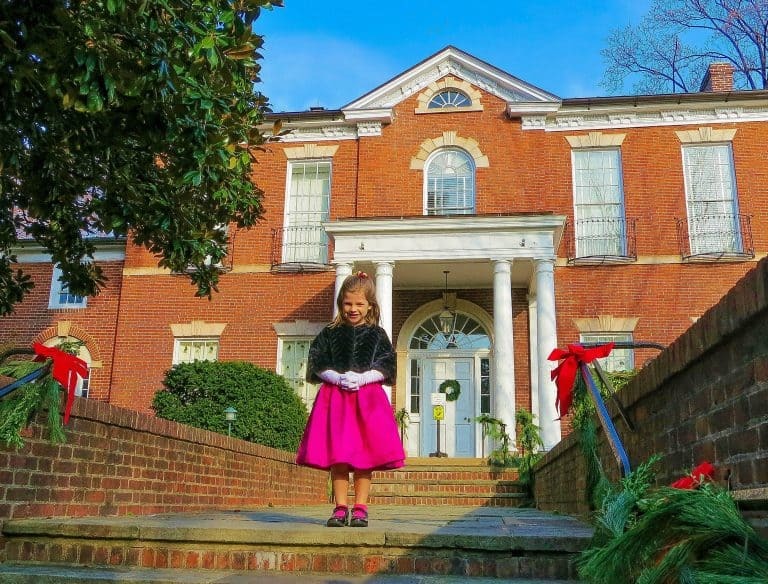 Then tour the mansion that was the home of George Washington. Walk down towards the river to visit Washington’s tomb as well as a memorial to the slaves that worked on the plantation. Plan to spend a full day exploring! 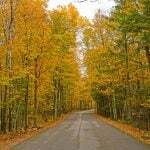 These are only a small sample of the day trips within a two-hour drive from Washington DC. For a more complete list, check out Trekaroo’s Top Ten Day Trips Within 90 Miles of the White House. Special thanks to Lesli Peterson who wrote the first edition of this article. All Photos are by Melissa Moore unless otherwise noted. 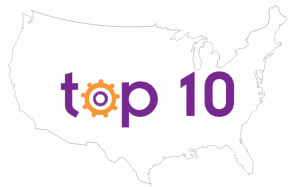 From coast to coast, we’re determining the Top 10 Things to do with Kids in each state of our great nation. Head here to see what tops the list in your favorite state.